Tojikiston Hotel is conveniently located in Dushanbe city centre, within a several-minute walk to business area of the capital and various entertainment landmarks. The Rudaki Park, favorite recreation spot of local citizens, is set just across the hotel building. 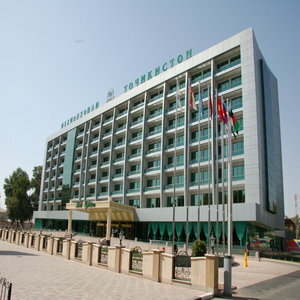 The central shopping mall, the Barakat East Bazaar and various other stores can be found in the immediate hotel surroundings. Tojikiston Hotel provides good opportunities for holding meetings and events with local and foreign delegates - business meetings, conferences, seminars, presentations, receptions, and banquettes. Guests of Tojikiston Hotel can also avail of the following - restaurant & bar, currency exchange, gift shop, beauty salon, laundry service, parking, porter service, taxi call, sauna with swimming pool, health complex, gym, wireless Internet connection.